The UMC-750’s dual-axis trunnion table positions parts to nearly any angle for 5-sided (3+2) machining, or provides full simultaneous 5-axis motion for contouring and complex machining. The trunnion provides +35 and -110 degrees of tilt and 360 degrees of rotation for excellent tool clearance and large part capacity, and the 630 x 500 mm table features standard T-slots and a precision pilot bore for fixturing versatility. The UMC-750 is a versatile 5-axis 40-taper vertical machining center with 762 x 559 x 508 mm travels and an integrated dual-axis trunnion table. The machine is equipped with an 8100-rpm inline direct-drive spindle, and comes standard with a 40+1 tool side-mount tool changer. The UMC 750’s 8100-rpm inline direct-drive spindle is powered by a 22,4 kW vector drive system. 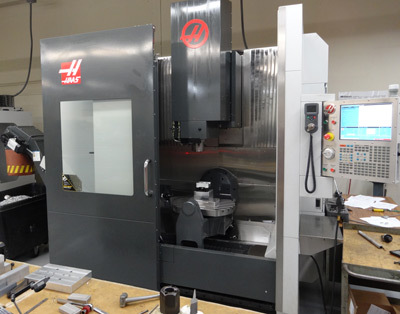 The Haas inline system couples the spindle directly to the motor to reduce heat, increase power transmission, and provide excellent surface finishes. For cnc machine shops wanting higher spindle speeds, an optional 12000-rpm inline direct-drive spindle is available. Both spindles yield 122 Nm of cutting torque. The machine’s 8100-rpm inline direct-drive spindle is powered by a 30-horsepower vector drive system. For cnc machine shops wanting higher spindle speeds, an optional 12,000-rpm inline direct-drive spindle is available. Both spindles yield 90 ft-lb of cutting torque. Wireless Intuitive Probing System, second home button, color remote jog handle, 1 MB program memory, 15" color LCD monitor, USB port, memory lock keyswitch, rigid tapping and 75-gallon (284 liter) flood coolant system. CNC Machining changes: Check what our precision 5 axis Haas UMC 750: 5-AXIS Vertical Machine Center can do nowadays!